Air and river pollution in New Inn village (East County Galway, Republic of Ireland). This semi-private www Internet page is intended mainly for the residents of the village of New Inn in East County Galway (Republic of Ireland). It may also be of interest to those who have responsibilities for ensuring that the laws associated with sewage disposal in the Republic of Ireland are enforced and upheld. For various reasons, there are no links to this page from the main part of our web site. The photographs below show a number of different sources of air and river pollution in the middle of New Inn village (in East County Galway). All of the photographs show were taken during March and April 2001. All of the discharges are within a few hundred yards (upstream) of the pump house used to supply the local community water supply. The pump house and associated underground water pumps are all close to the river (just behind the Primary School). Sometimes the river floods to several times its normal size, and when this happens the flood water tends to move in around the area where the pumps are. The discharge shown in the photograph below is believed to come from the Primary School in New Inn village. It goes straight into the river. It is thought that there are just over 100 hundred children (aged between 4 and 13) attending the Primary School. The gaps shown below between the covers of the Primary School septic tank seem to be one of the main causes of air pollution in the village. The arrangement photographed here is within a few feet of the main road to the local Community Centre. This road is frequently used by pedestrians, and they include those who often need to walk the short distance between the Secondary School and the Community Centre (which has sports and other facilities used by them). 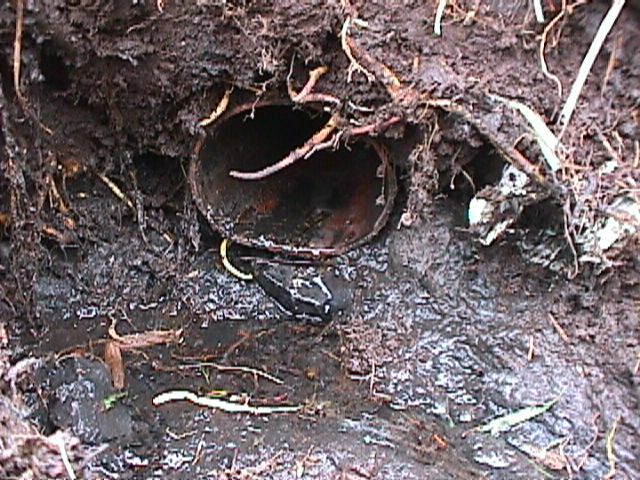 A square concrete drain, with a circular pipe inside it, can be seen in the photograph below. 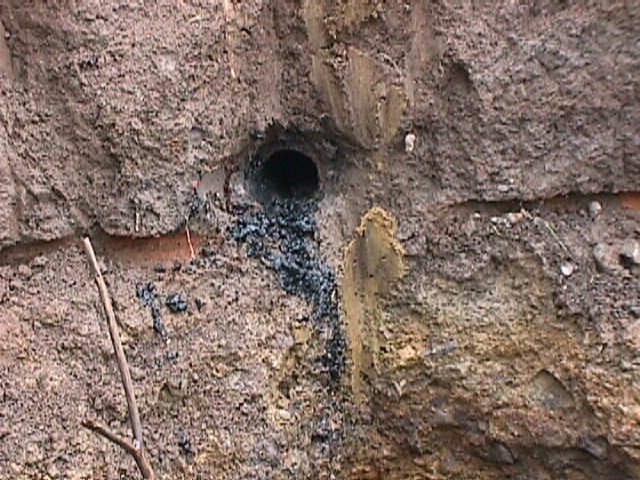 This set-up is thought to contain two separate sources of untreated sewage. One of the sources is understood to be the New Inn Secondary School which is believed to have approximately 230 teenage pupils. 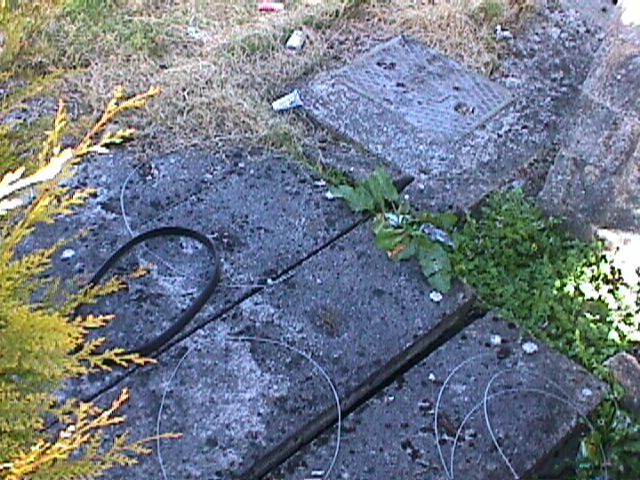 The arrangement below (which is right next to the bridge) is within a few feet of the main road through New Inn village, and within 20 feet or so from the Diesel pump used by Finnerty's business premises for selling car fuel to the general public (which of course includes tourists). The discharge into the river shown in the photograph below is approximately 30 feet to the south of the one shown in photograph 3 above (i.e. on the same side of the bridge as Finnertys, but further away from it). Sewage-contaminated water may contain the health threatening bacteria known as E. coli 0157:H7. This particular strain can cause major medical problems including the complication known as HUS (Hemolytic Uremic Syndrome). HUS is a very serious disease which causes red blood cells to be destroyed, and which in turn gives rise to kidney failure. Sometimes it kills the patient. Apparently, the young and the elderly are the ones most at risk. 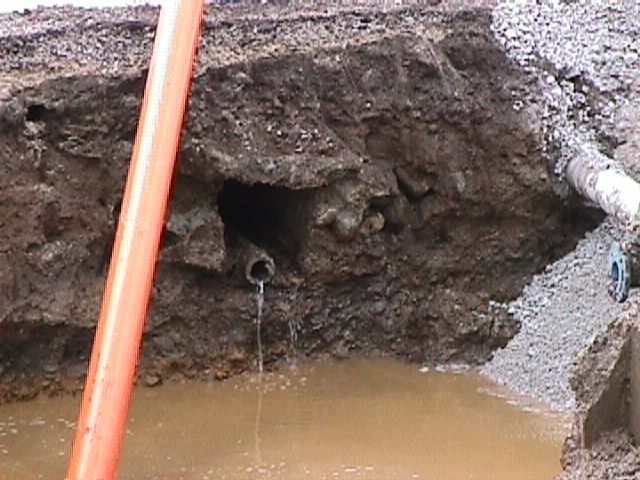 Although there might not be any connection at all with the above mentioned sewage discharge problems, the late (and elderly) Mrs.W.T. Finnerty did nevertheless suddenly take ill, and died 10 days or so later, from kidney failure (approximately 10 years ago); and she is not the only person in the village known to have developed very serious kidney problems in recent years. An Email dated April 20th 2001 regarding the above matters has been sent to Mr Noel Dempsey T.D. who is the Minister at The Department of the Environment and Local Government. We hope to keep this page updated as events develop. Copyright © 1999 to 2001 by William Patrick Finnerty. Mr W. P. Finnerty (contact information provided below). or to provide electronic links to this web site. NOTE: The "visitor number" which appears below might not be correct.